Will G-20 see a new global financial order? With an economic contraction looming behind, Prime Minister Manmohan Singh’s trip to Washington DC to attend a global financial summit on 15 November seems a little odd. But when the epicentre of the contraction lies in the credit crisis of the US, it is the only logical destination. Singh is one of 20 heads of state of the world’s wealthiest countries—the G-20—getting together to fix their economies. But the Summit on financial markets and the world economy that begins two days later will look beyond financial markets. What can one expect from this Summit? "Nothing," said a senior government official working behind the scene. 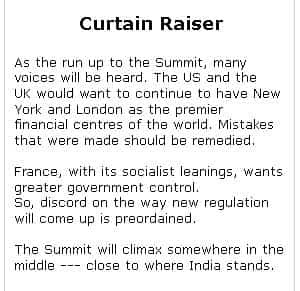 The best that could happen in this meeting where the US President George Bush has invited heads of state, finance ministers and their top bureaucrats of G-20 will be to frame set the confines within which the birth of a new global financial order will take shape. All will dwell on the new geo-politics taking shape and engage in a new wrestling match, where the sovereign right to regulate domestic markets will come under pressure from a global necessity to work together—and perhaps accept a global regulator. The latter is a position that capital markets regulator Securities and Exchange Board of India agrees with using IOSCO as the executive arm, said another top official. But the Reserve Bank of India is hesitant. It feels while global standards are alright, regulation should remain domestic. Although working on the fringes, India is likely to play a leading role in the finals. Already, ambassadors of at least four countries have written in, to work together, in what could be known as the Singh-Brown (Gordon) plan. The India position is a mid-way between the unfettered free rein to markets that the US offers and the conservative socialistic calls that Sarkozy is attempting to take leadership of. “France wants a global super-regulator who will rap the pesky FSA (UK’s Financial Services Authority) on the knuckles when it does financial liberalization," an economist, watching and working with these developments, said. “India likes markets, but better regulated ones," the official quoted earlier said. “We have seen what the other option is in the first 45 years." Singh’s rather understated line today, at the BIMSTEC meeting in Delhi stated as much: "Countries in Asia should give a new thrust to cooperation in the backdrop of the financial crisis."